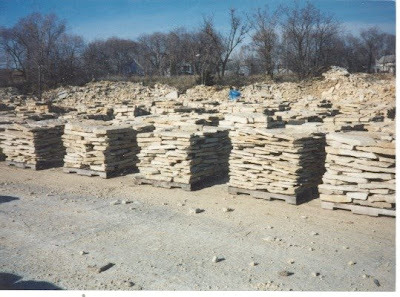 Saturday morning we headed to a nearby quarry to pick out the flagstone; two tons of the stuff. From there we headed to Home Depot and Menards to price out the material. 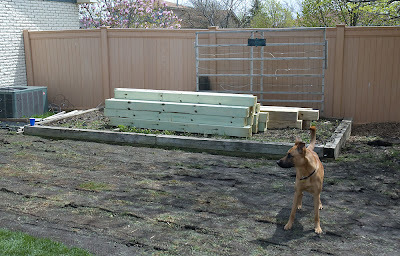 We purchased everything needed to build a picket fence, including a trellis, yay! 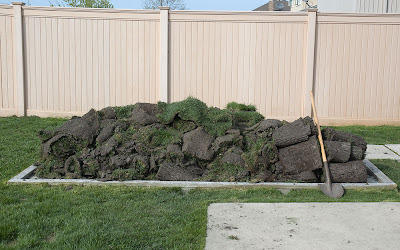 This morning Paul ran to Home Depot to rent said sod cutter and a truck to get it here. 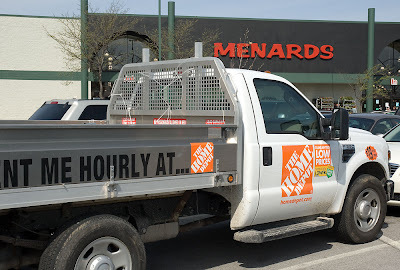 Then he ran to Menards for the landscape timbers needed for enlarging the garden…in the Home Depot truck. …and where the dogs had trashed it. Unfortunately we didn’t think ahead and get a dumpster, so we had to pile it on the concrete slab that will someday be home to a hot tub. 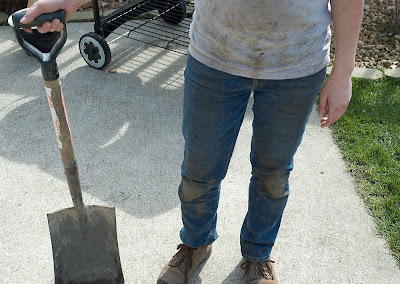 It was a backbreaking day, and it’s just the beginning. 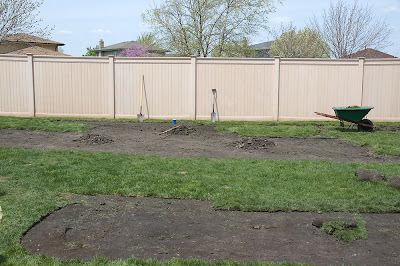 We still have to move that pile of grass to the dumpster, lay the new sod, carry and place two tons of flagstone, frame the new garden area with the landscape timbers, order dirt and fill it, and build a picket fence. To be continued, right now I’m in bad need of a shower. Okay. Now I feel like a wimp. Ah yes, the escalating summertime project! It's a lot of work but you'll love it when it's done. Yeay! Wow, you are overly ambitious, just like me! Good luck with all that, girl. My back is hurting just looking at that huge project. I think we're done with those bad boy projects for a while. Hot tub? I'll be right over...well as soon as you actually HAVE the hot tub. Sweet - a hot tub!!! Oh I know in time but this project sounds like fun - because the pay off is - well right around the corner right?! Yeah, I think we did the projects in reverse. We should have gotten the hot tub first, then we could have soaked our weary bones after all this hard work. Oh well, hindsight is 20/20. It's gonna look great, I know it. LOL Papoo went to Menards in a Home Depot truck!! Thats hilarious! !